Can we first talk about how cute it is that this recipe has both baby heirloom tomatoes and baby artichokes? Is it totally giving you baby fever? OK, I’ll admit that it isn’t for me. But you know what did it for me? Boomer Phelps. Seriously, how cute was he with his big baby headphones and napping self? Watching him cheer – or sleep through – his mega-athletic dad’s ultra-human swimming during the Olympics kind of gave me a bit of baby fever. Well, it was more of a low-grade fever. I’m so far removed from the little baby years that I don’t even know if I remember how to change a diaper properly. Plus, how am I going to take care of a little baby AND my rosés? Last week my father asked me to make a salad for him to bring to a party. He was getting together for a cookout with all his friends from his Zumba class. My father is considered elderly on paper, but the fact that he goes to the gym regularly and takes Zumba multiple times a week, with a great group of people, totally crushes the definition of elderly. He invited me to his Zumba class a few months ago and it was a lot of fun. So much great energy, it was more like a dance party instead of a workout. Have a I mentioned that I can’t dance to save my life? I was the person that went left when everyone went right. And my rhythm was more lost than ever. Still, it was a fun class and everyone was so nice and friendly. What was really cute was seeing how happy everyone was to see my father when he arrived. He’s definitely a rock star in his Zumba class. The Zumba party was to celebrate one of his friends, who is going away to Scotland to get her Master’s Degree. (How cool is that?) He asked me to make the famous potato salad (http://www.thetastypage.com/moms-potato-salad/), but I knew the celebrant is vegetarian and I didn’t think the hard-boiled eggs in the potato salad was going to be a good fit. I thought a pasta salad with some nice, fresh vegetables and fresh herbs would be great. Oh, man. Was it great. I have to admit, this was the first time I was making this salad and I had some reservations about serving it without having some experience making it yet. But for me, that’s one of the best ways to try out a new recipe: let’s all dive into this new experience together! The original recipe calls for fresh baby artichokes; trimming, cutting, and scooping out the choke before boiling them in lemon water. Looking at the step-by-step instructions, I thought it didn’t look so hard to do. But then I opened my pantry and saw a beautiful can of artichokes and decided that opening the can was A LOT easier. As the pasta was cooking, I started to cut my ingredients and put them all in a large bowl. 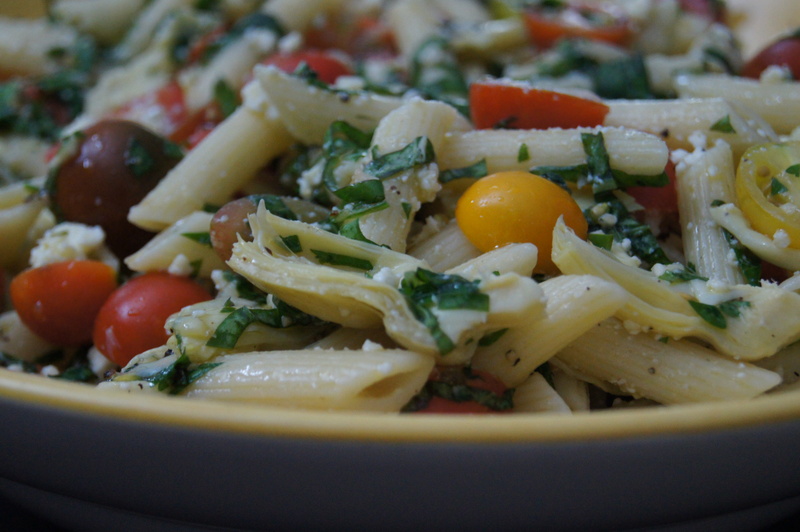 The colors were so pretty and even though I hadn’t tasted anything yet, I knew this was going to be a delicious pasta salad. Then everything came together in the bowl and it was gorgeous. 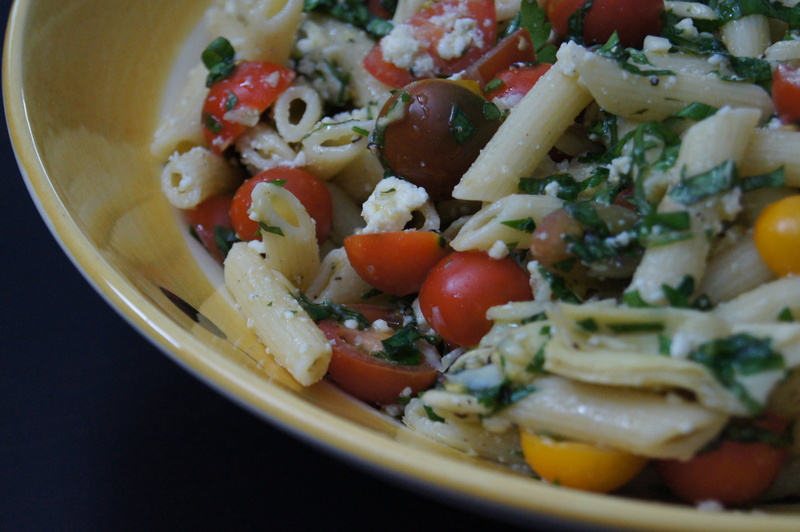 It was so colorful, and when I added the basil and lemon the salad seemed to sing. OK, that was me singing. I was listening to The Get Down soundtrack, which is so amazing! If you watched The Get Down on Netflix you’ll know that you can’t help but to sing along too. I wasn’t dancing though. My rhythm is still among the missing. When I tasted the salad for seasonings, I was blown away. So good and so fresh! And if you don’t have the ricotta salata – or don’t want to add it – it’s still really good without it. And I’m happy to report that it was a hit at my father’s Zumba party! He said everyone liked it and not an ounce of it was left. I love pasta. But I hardly ever have it. I consider it a huge treat so if I’m going to have it, it has to be totally worth it. 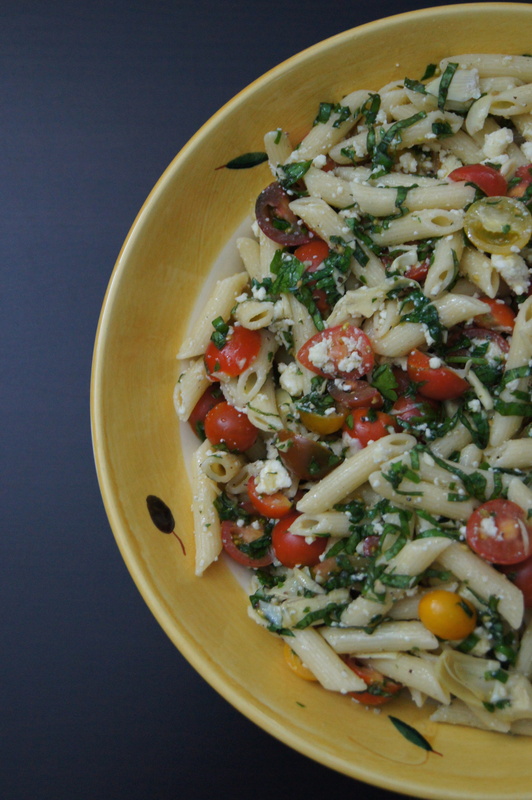 And this pasta salad is totally worth it. Prepare a large pot of water to boil. Once the water boils add a handful of kosher salt followed by the penne. Cook according to the package directions. Drain and rinse under cold running water to stop the cooking process. While the pasta is cooking, place the lemon juice, the artichokes, tomatoes, basil, parsley, garlic, and olive oil in a large serving bowl, season generously with salt and pepper, and stir to combine. Set aside. 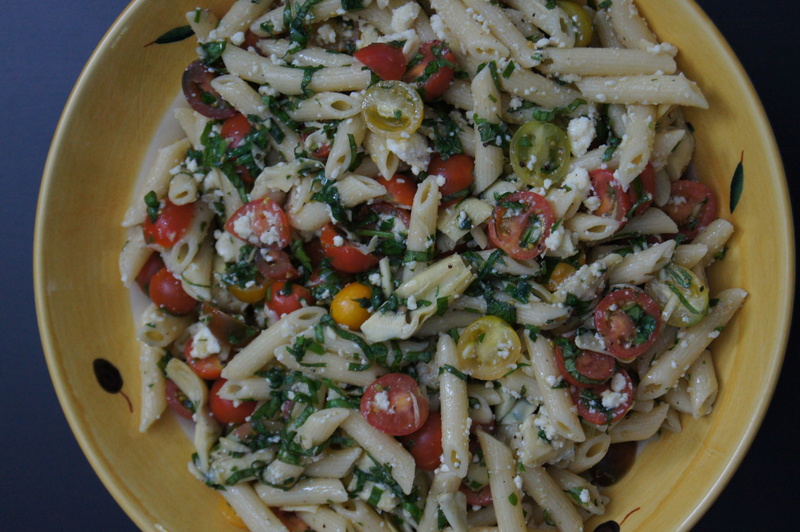 Transfer the pasta to the bowl with the tomato mixture, add the ricotta salata, and toss to combine. Taste and season with salt and pepper as desired.